Here’s a step-by-step tutorial for making homemade almond milk in a Vitamix, including a video! This recipe is budget-friendly and free of preservatives. You can use it for all of your dairy-free needs. Homemade almond milk is one of the small luxuries in life. It’s so much creamier and delicious when you make it at home, and you don’t need one of those expensive nut milk bags. You’ll see how I use a clean paint strainer bag instead, for so much cheaper! Next, I get my supplies ready. The recipe inspiration I got made the brilliant suggestion to use a clean 1-gallon paint strainer bag like this one. This material is nylon, but it is re-usable as long as you rinse it well. Feel free to use a nut milk bag made of natural materials such as hemp. but the paint strainer bag works just as well for so much less money. After blending, you pour the mixture through the opening of the strainer bag and then squeeze from the top down to force the liquid out of the bag into the bowl. Sorry, no photos of this step, but it required both hands. There you have it…homemade almond milk with no sweeteners or preservatives. I made a video to show how easy it is to make homemade almond milk at home in a blender like a Vitamix or Blendtec! 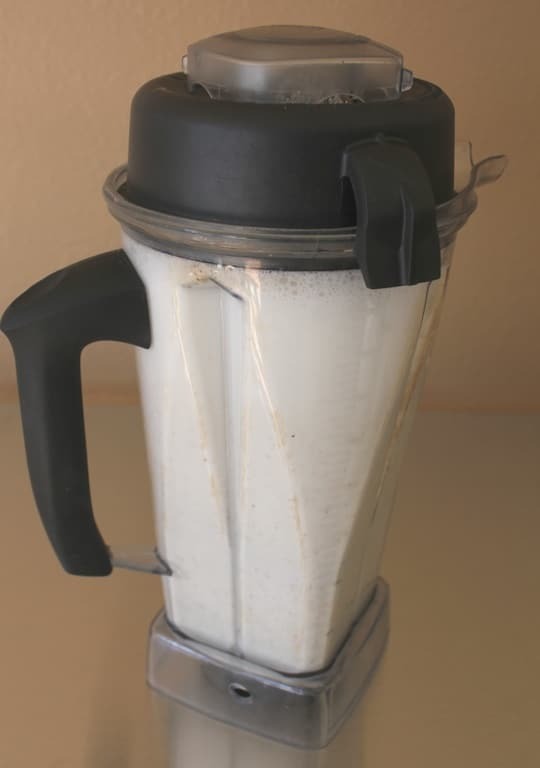 Here is a recipe for homemade almond milk in a Vitamix with no added preservatives. This recipe is easy and budget-friendly. 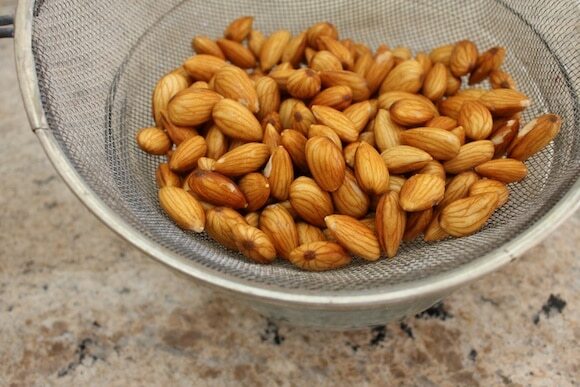 Place the almonds and filtered water in a high-speed blender. Blend on high for 30 seconds or up to 1 minute. Pour the mixture into the strainer bag over a larger bowl. Use your hands to squeeze the liquid into the bowl. Discard the pulp or save it for another use. Store the almond milk in the fridge for up to 5 days. You can use almond milk for just about anything, including baking. It will stay fresh in the fridge for up to 5 days. If you like this recipe, you might also like my recipes for Creamy Cashew Milk, Macadamia Milk, or Homemade Coconut Beverage too! Carrie, I make almond milk essentially the same way, except I don’t bother with the soaking part. Just curious…Why do you soak them? Hi Carry! The soaking part is to help get rid of the phytates from the nuts. It isn’t absolutely necessary, but I do it. The soaking also helps soften the nuts for easier blending. I have never made my own almond milk. I wonder if the paint bag is really safe for using with food? I am excited about you cooking your way through Chef AJ’s book I had thought about doing the same thing but it contains way too many dessert recipes for me – I just can’t have all those extra calories. I look forward to seeing what you make. Everything I have made from her book has been delicious and pretty easy. I love Chef AJ’s videos – she is smart, funny and a great chef! I ordered beer making strainer bags from amazon. Much cheaper than nut milk bags and basically the same. I have used both the paint bags for sprouting and the nut milk strainer bags that are said to be food grade. I don’t have a way to test them but err on the side of getting the nut milk bags now from a reputable organic supplier. There are many. Your choice. I always use the nut bags I got on Amazon because they are food grade. There must be a reason, and I am being cautious about any extraneous carcinogens. And they are cheap! I am thrilled you are going to cook recipes from Chef AJ’s book. I bought the book for myself and several friends. I enjoyed Wendy cooking through the Eat to Live cookbook. This is great! I love almond milk but I don’t have a vitamix… I do have a blender/processor with a pretty good sized motor, how long do you think it requires blending? It usually takes me about 14 mins to make almond butter if that helps for a reference. Thanks! I love the idea to feature recipes from a favourite book! 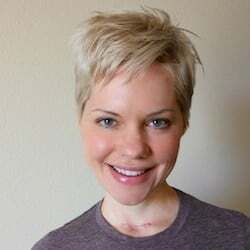 Hi Manda! I think the blender function would work fine for this recipe, especially since the almonds will be pre-soaked which means they will have softened. You might just have to run it for a longer time period, like 45 seconds to a minute. I burned out an older blender when I first started doing this but think I expected too much from it. I think if the almonds are soaked well and maybe chop them up first. Make sure you have plenty of water in the blender when you begin. If you can make almond butter, it sounds like a pretty sturdy motor. Homemade almond milk tastes so good. I love it but I have a hard time using up the leftover almond pulp at the same rate that I use the milk. It’s frustrating because I don’t want to waste it. This is great and much cheaper. Do you use organic almonds? 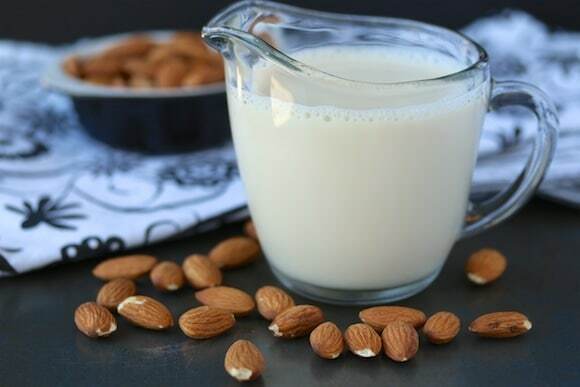 As most store bought almond milk is fortified with Calcium and vitamin D, do you have any concern of not getting adequate Calcium and Vitamin D (I understand that you can get all the calcium with other nutrition rich food or you can use supplements). Hi Kanishka! I do have concerns about calcium and vitamin D, so I supplement with those separately (in addition to eating tons of leafy greens and other calcium-rich foods). My biggest issue with the store-bought almond milk is the sodium and other stuff that’s usually in them. That said, everyone has to make his or her decision. I’m glad you brought up this issue. Also, to answer your question about using organic almonds, it mainly depends on what I can find at a decent price, although organic is always my preference. I don’t know about the paint bag, but Vitamix has a filtration bag made from hemp. Honestly, I think some kind of new, clean, flat organic cotton laid in a sieve might be as easy or easier than a bag (especially when it comes to cleaning the seams area). Why is my picture a pink diamond? Thanks for the input, AJ! I love your idea of using the bag to squeeze out liquid from steamed greens, too. Brilliant!!! The reason I asked about this is because I know that some plastic products are not food safe like BPA and they can leach chemicals and some plastics are not food grade quality meaning they are not meant to be used with food. There is a grading system for plastic and some plastics are not safe for multiple use with food because they start to degrade and leach chemicals. I only buy BPA free canned goods and BPA free plastics for use in my kitchen. I don’t heat food up in my microwave in plastic containers, I don’t reuse the plastic drinking water bottles because they are not made of the type of plastic that is for multiple uses. I know I shouldn’t use them at all because they aren’t good for the plante but I sometimes do! I think it’s a legitimate question – I wasn’t trying to upset anyone. Rather I am just trying to figure out if the bags are safe to use with food and if they are safe to use multiple times. I will do an internet search on this and see what I can find out. Well, you could be right which is why it’s great to do the cheap and easy method. No bag involved. But aren’t tea bags also made of nylon ? Hubby and I did some on line research about the nylon paint bags and we found lots of other folks who were researching the same thing. On a message board about making almond milk we found a thread where a guy was asking the same question and he set out to get an answer. He contacted the manufacturer of the paint bags sold at Home Depot by phone and email and they never made contact with him. He said he never got past a friendly secretary. In the end he decided to go with food grade nut bags. We did learn that all nylon products are not equal. They are made with different chemical mixes depending on what the intended use is for. Nylon products are given grades and only certain grades are approved by the FDA for contact with food. The tea bags that are made from nylon are an FDA approved grade for use with food. I can’t find anything about the grade of nylon used for paint bags. 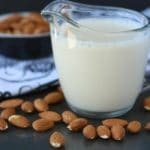 Your method of making almond milk using almond butter sounds easy – what are the portions for that? I use one tablespoon of raw almond butter to four cups of water when making it for myself and two tablespoons when making it for my husband, since you can’t get truly raw almonds anymore anyway, they are now always pasteurized, I don’t see the reason to make it with the almonds. It’s more difficult, more expensive, more time consuming and more waste, unless you have a use for the pulp. Thanks for the instructions for making almond milk with almond butter -that is so easy even I can do it! I’m just about to make a new batch of almond milk, I make it exactly the same way. It’s one cup of almonds to four cups of water, Phyllis. Mmm homemade almond milk. I was doing this for awhile, then I kind of stopped and started buying again. It’s so quick & simple to make, I really should go back to making my own. This is such a great idea, Carrie, and I love it! I adore you and Chef AJ. I have to make this homemade almond milk soon. I can’t wait to see what recipe, from the book, you do next time. It is very important that any plastic container or item you use in preparing food is made of FDA approved food grade plastic. Acids found naturally in food can react with plastics can cause them to degrade and leach chemicals into the food. Temperature of foods can also degrade plastics. 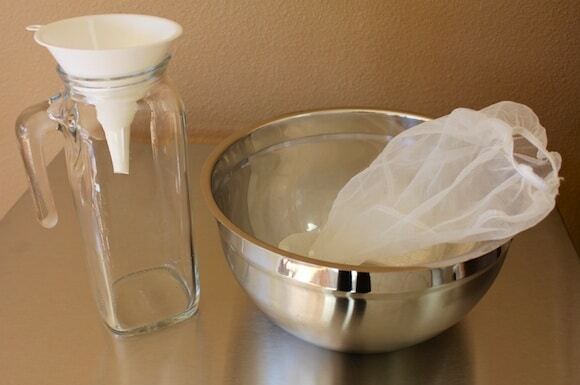 Jelly straining bags may be useful for straining the almond milk. They are usually made of 100% organic cotton fabric and are washable. They are used to strain fruit juice from the fruit pulp when making jelly. These can be usually be purchased in grocery stores in the canning supplies section (by the Ball canning and jelly jars) or online. You can also make your own jelly straining bags if you are handy with a sewing machine. You can find instructions for making your own on the web. Just search on “jelly straining bags”. Do not search on “jelly bags” because there is a brand of purse with that name. Hey, Carrie! I make my own and had my hubby do a blind taste test with Whole Foods fresh almond milk. He was sure he knew which was WF – and he was wrong! Mine won by a mile. I dry out the pulp in the oven on the lowest setting, then pulse it in a clean spice grinder to make almond flour. Works great. You get about 1/2 cup flour from each batch. Yay, thanks for sharing that, Linda!!! I’m not surprised your husband picked homemade. It’s SO much creamier!!! I love your idea of using the pulp to make almond flour too. Thanks for the note. XO. So easy! I love that you can avoid all of the preservatives and additives making your own! I can’t tolerate a lot of the additives! I love making homemade almond milk as well! So much better than the store-bought version!! Trying to make sure I have this right… almonds can be pasteurized?! Again I am amazed at how hard it is to just have natural food. Most almonds are heat-treated, Brit. Even the raw ones aren’t actually raw! If you want a truly raw almond, you usually need to go to a small farmer, at least that’s what we have to do here in California. In some parts the States, it’s illegal to sell really raw almonds. Crazy, right?! Thank you for such clear and concise instructions on making almond milk! It is certainly something I need to do, so thanks for this useful resource! Fantastic! Ohhhh, you’re so welcome, Darryl! Thanks for the visit to my site and the kind words. Once you go homemade you can’t go back! Thank goodness for my Vitamix! I always end up just buying it – but you make it sound so easy! I should really do this sometime. Thanks! Love almond milk and the homemade version makes everything tastes so much better. Thanks for sharing ! You’re so welcome, ChihYu! Have a great weekend! Thanks for sharing this. 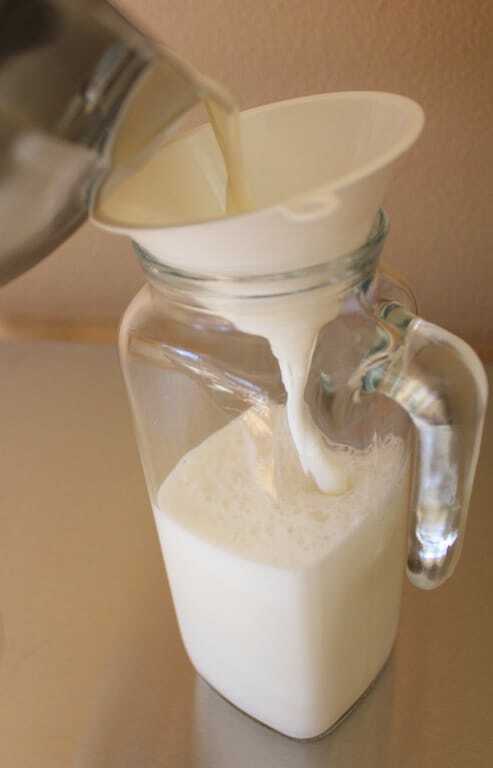 I don’t think folks realize how easy it is (and healthier) to make your own nut milks. I make cashew milk this same way. What I love about cashew milk (besides the insane creamy taste) is that there is very little pulp/waste left over. This almond milk looks so creamy! I just need to try to make it myself already 🙂 Definitely seems worth it! I honestly think store-bought almond milk tastes pretty blah. Is homemade almond milk more flavorful? Hi Rachel! I like to add dates and the seeds of a vanilla bean to give it more flavor. But, even plain, the homemade tastes really creamy and delicious!!! XO. I love how easy this is! Homemade is the best! The bonus of homemade is always knowing what’s in the final product! I only buy cartons of almond milk when we’re camping because they always put extra stuff in it. Right, Kari?! It’s so crazy all the preservatives and ick ingredients in the boxed stuff. That said, I buy it when I travel as well, but making it when I’m home is my preference. XO! 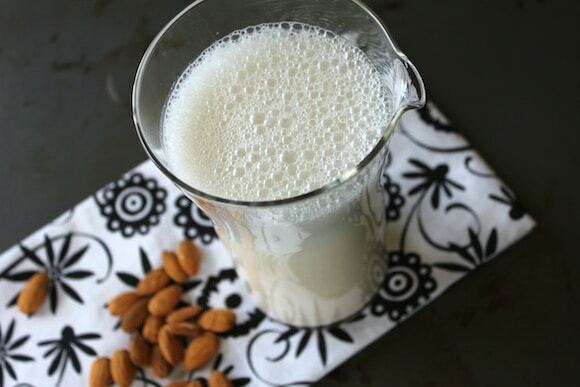 Love how simple homemade nut milk is! And you know exactly what’s going in it. Love making almond milk, people don’t realise how easy it is to do, great instructions. I love homemade almond milk! SO much more delicious and creamy than store-bought. I love almond milk so much! Thanks for sharing this fabulous recipe! You’re so welcome, Hannah!!! XOXO. Thanks for your recipe I will be giving this a shot in a few minutes. I have a question for you…, can I reuse the pulp again for another batch of milk?